We all have them, right? These weird habits that our love ones make fun of us for? Dereks? His slight obsession with collecting the mail. Not only does he prefer to get the mail, no one is allowed to touch it until he has organized it into proper piles. My habit that he hates? When I read the mail as I am walking back into the house. "Why can't you just wait until it is organized and ready?!" 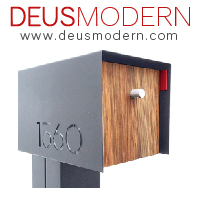 So now you probably know why when we received our Deus Modern mailbox, Derek said, "This is a game changer."